So I might have a new hobby. And it’s kind of more like manual labor. I'm ready for you to make me smell less disgusting. It’s true. We got a house!!! It’s our first home and we’re excited…and a little poor. And the new house is actually an old house that needs some fixing up. Oh, and it smells like a nasty wet dog peed on itself and rolled all over the carpet for a year. So we have to clean that up. But, a little TLC comes with a price to pay, namely time. So, please forgive me if in the coming weeks I am a little lax in my posting but I will putting my talent to good use fixing up a bungalow for us to live in. I’m on my way to not being a basement troll anymore!! 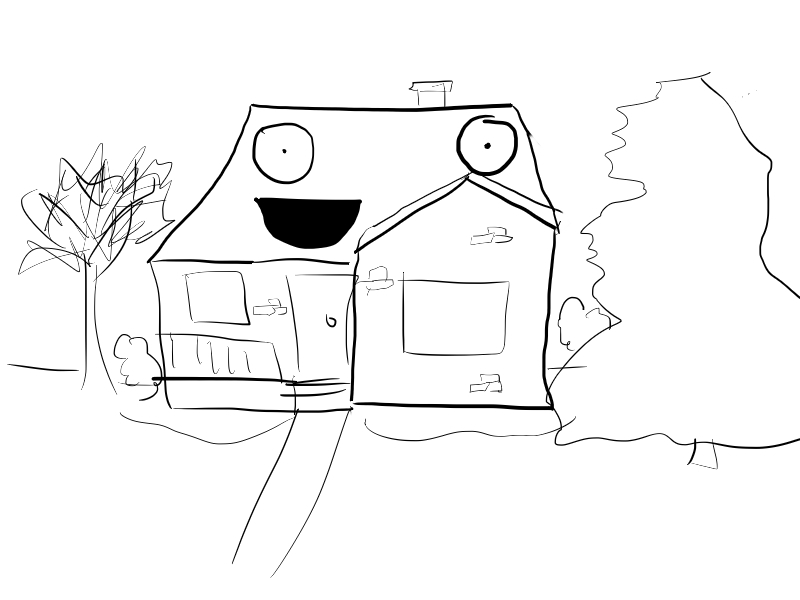 Here is a sketch of our house getting excited that someone will love it again! I think I’m going to think of a name for our house. Do people do that? I mean, I know people name them like “Sunset Manor” but I was thinking of a person name. Like Edna. More on that later. Please call him Mr. Duncan now. You know, it’s just a Shetland pony driving a car. I don’t think it’s any more silly to name a house than a car. And I know how you feel. The first week I moved in our house, I cleaned out dust like an inch thick in the built-ins. I’m not sure what all the stuff I dusted out was. Mouse pooh? Anyway, it took a while, but I’m really starting to get past the emergency maintenance and into the more fun stuff. I wish you luck! I hope you really enjoy your new home.